Myanmar, also known as Burma, is bordered by India and Thailand, but the cuisine—which is just starting to emerge on menus—is characterized more by sour and pungent ingredients than spicy and sweet flavors. 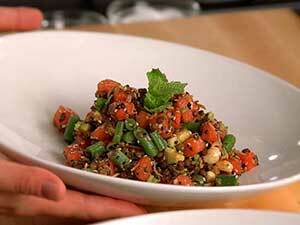 A seasonal watermelon salad is a familiar way to introduce Burmese flavors to customers. This refreshing dish is a toss of cubed watermelon, creamy avocado, peanuts, green lentils, green beans and coconut flakes drizzled in a soy dressing. 1. In large bowl, combine watermelon, avocado, lentils, green beans, ginger and kaffir lime leaves. Toss gently and set aside. 2. In saute pan over medium heat, add peanuts and toast until browned. Add sesame seeds and coconut. Toss frequently until coconut is lightly browned and toasted. Remove from pan and cool. 3. In separate bowl, combine lime juice, sugar, soy sauce, fish sauce and salt. Slowly whisk in peanut oil to combine. 4. To serve, pour dressing over watermelon, add the toasted ingredients and toss gently to combine. Season to taste. Serve at room temperature and garnish with mint.